German quality belts - for more than 30 years. German quality for more than 30 years. 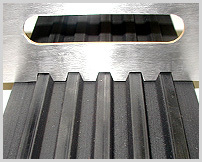 As an efficient supplier of haul-off-belts, conveyor belts and rubber parts, we are looking at more than 30 years of experience. Since its founding in 1973, the company has grown from small beginnings as an engineering company to a globally acting business now. When processing your order, we guarantee know-how, quality and best service. Keeping due dates and being most flexible applies to our mission! It will be a pleasure for us to be at your service! High quality demands of our customers are justified by continuous product monitoring. Keeping due dates and being most flexible applies to our mission!